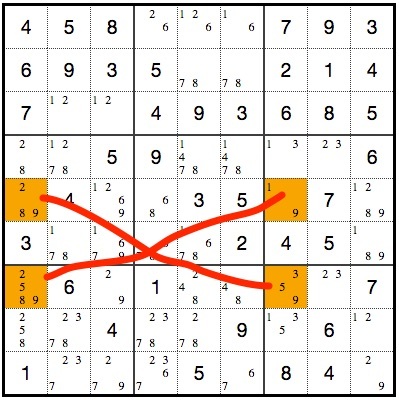 X Wing is an advanced sudoku technique, which means that the end result will not necessarily be finding the number that goes in a cell. What will most likely happen is that you will be able to eliminate numbers from sibling cells which will then lead to finding final numbers using other techniques. X Wings occur when two rows or two columns contain the same number only twice and in the same location. It gets its name from how the 4 cells form an X. When you find one, you know that the number involved has to appear in two of the four cells. It will appear along either diagonal. You don’t know which diagonal yet, but that does not matter. Just knowing that it is one or the other is enough information to eliminate that candidate from siblings. In the two highlighted columns, the number 9 appears only twice. In effect, we have identified a naked pair in each of the two columns above. The problem is that the naked pairs do not take place in the same box so they can’t be used in isolation to eliminate candidates. However, because both naked pairs are located in the same row of both columns, they can be used together. 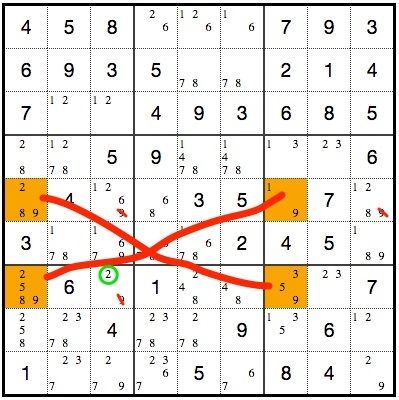 The number 9 has to appear along either of the two diagonals. Notice how it forms an X? Now we can eliminate 9s from other cells. The information uncovered by the X wing allows us to treat the two rows like they have naked pairs of 9s. 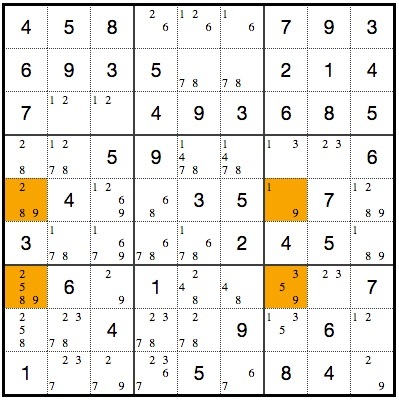 Now we can eliminate 9s from the highlighted rows, and we even identified a final number of a 2. This puzzle will be much easier to solve now. Just remember that the sudoku beginner hint generator is not smart enough to find X Wings. You’ll have to find them on your own. Good luck!